It's hard to escape the Stan Lee 'Nuff Said hype surrounding Spider-Man as the flow of comic-book movies continues... but with all the hype come high expectations. 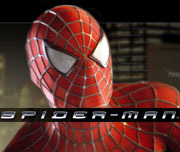 Sam Raimi proved his superhero stuff with Dark Man and he puts a deliciously dark twist on the Spider-Man tale, creating a heroic yet tragic figure with which one can identify as Peter Parker tests his conscience and his new abilities simultaneously, while of course leaving the door wide open for a sequel or two. A movie like this is now expected to meet the highest standards in terms of visual effects, and unfortunately Spider-Man is sometimes weak in this regard. It looks as though they were fine-tuning the effects as they went, as the very fluid and non-intrusive motion in the final scenes is in stark contrast to some quirky, jumpy renderings earlier on. Especially in some of the overhead views of Spidey in action, he looks like a quirky animated computer game character, creating disbelief which prevents total immersion in the Marvel universe. Tobey Maguire does pull off the superhero nerd dichotomy well, as does Kirsten Dunst as the girl next door Mary Jane. A few scary moments and fairly gruesome fight scenes suggest that this movie is not for those much below the pre-teen set. Worthy of viewing on the big screen for the effects (at least in the second half) and sound, but just barely. File under "X-Men with more self-doubt and less super-heroes".